Indiana AgrAbility staffed an exhibit at the 2018 Indiana Farm Equipment and Technology Expo at the Indiana State Fairgrounds in Indianapolis on December 12-14, 2018. Formerly the Indiana-Illinois Farm Show, the exhibit provided the attendees an opportunity to see the Action Track Stander power wheelchair, a John Deere tractor with a Life Essentials lift, AgrAbility brochures and publications, and Tools to Make Your Life Easier. Indiana AgrAbility staff and consultants provided additional information and answered questions concerning available services. Purdue University and Indiana AgrAbility staff honored Denise Heath, Indiana AgrAbility administrative assistant, for her 40 years of service at a luncheon in the Purdue University Memorial Union. She was honored at the luncheon with a certificate and gift from Purdue University. Indiana AgrAbility staff conducted several farm visits across Indiana. Client conditions included spinal cord injuries, back impairments, arthritis, leg amputations, and PTSD. Plans of action and referrals were developed for each. Elizabeth (Casey) DeFreese (PhD '12) was promoted from Senior Scientist to Manager of Microbial Fermentation and Recovery Development at Novozymes in Research Triangle Park. She has been with Novozymes for almost 7 years. Congratulations! 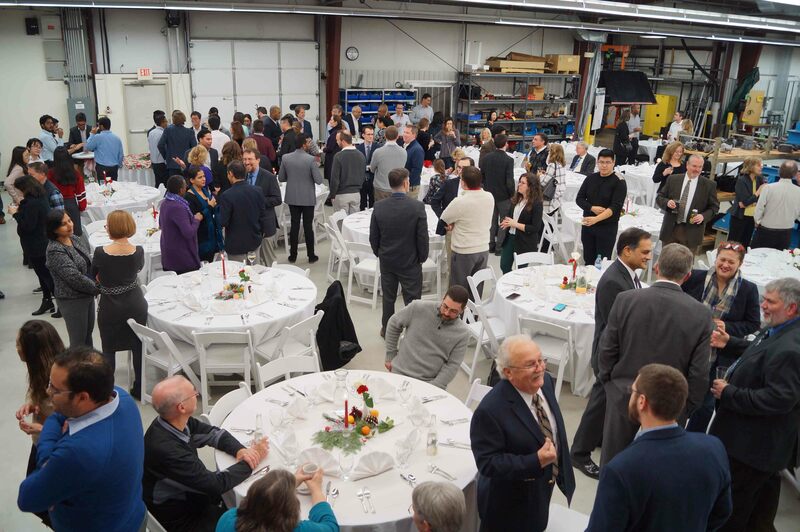 On December 7th, the industrial hall housing the Maha Fluid Power Research Center’s test rig collection turned into a makeshift banquet hall: a sea of white tablecloths, folding chairs, and well over a hundred guests crowded the expansive lab space. Present and former students of the Center, Purdue faculty, Provost Dr. Jay Akridge, Dean of the College of Engineering Dr. Mung Chiang, ABE department head Dr. Bernie Engel, and ME head Dr. Anil Bajaj, among other distinguished guests, had all made their way to Maha to honor the memory of its founder and former director, Dr. Monika Ivantysynova. Dr. Ivantysynova passed away in August of 2018— but this was no funeral; rather, the event was a celebration of her life. It was the celebration not only of a stunning repertoire of academic achievements, including two honorary doctorates and the Koski medal, but also of the spirit of a woman who loved life and who, with her mind made up, could never be deterred from building one brick higher. Dr. Akridge and Dr. Engel each took the stage at the event and told, in turn, from their respective perspectives, the incredible story of Dr. Ivantysynova’s arrival in the US in 2004: she was in the process of transporting her entire lab to Purdue from Germany, with the massive test rigs already boxed and out in the middle of the ocean, only to find upon arrival at the university that the promised space for her new fluid power center was not available. The move across the ocean was a big risk for her to begin with, and what on earth would she do with all of the equipment when it arrived? 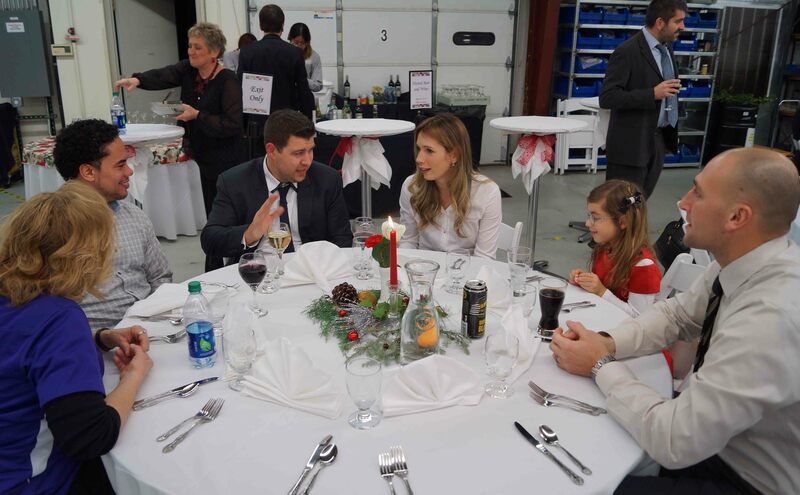 But where there is a will there is a way— together with Dr. Engel, Dr. Ivantysynova was able to get a hold of some university storage space for her equipment, and went on to found at Purdue University the largest fluid power laboratory in North America. The Maha Fluid Power Research Center would like to thank everyone who attended the event— especially the speakers Dr. Akridge, Dr. Engel, Dr. Bajaj, Dr. Sadeghi, Dr. Gore, Dr. Hirleman, and Dr. Chiang, for sharing the stories of their dear faculty member and colleague. A very special thanks goes out to Roman Ivantysyn, Dr. Ivantysynova’s son, who gave a beautiful presentation about her personal life, and how she came to be the professor we all knew. 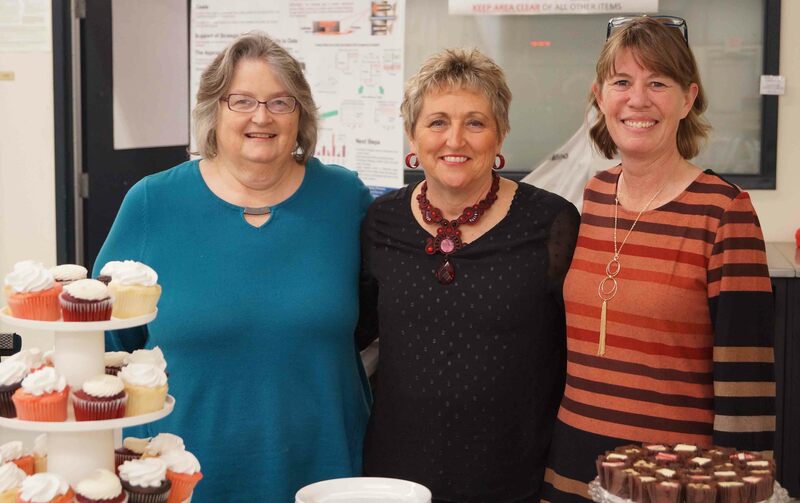 Last but not least, the Maha Fluid Power Research Center would like to thank Susan Gauger, our wonderful secretary who not only organized this amazing event, but who has been a most beloved part of the Maha family for many years and is now retiring. We wish her all the best, and we miss her already. January 1 always brings changes and 2019 is no exception. 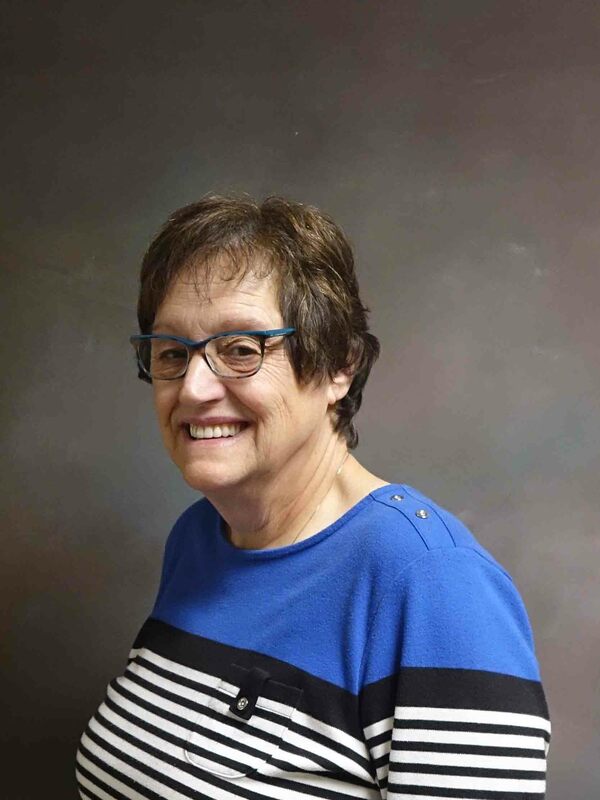 Following the retirement of Barb Davies, we welcome Kathy Poindexter to the main office. Kathy has been at the University in several different departments before coming to ABE - Pharmacy, Technology, Liberal Arts, and Development - so she knows campus. Her favorite color is black and her favorite food is "anything sweet" (a hint to those trying to get on her good side!). Chocolate ice cream is always welcome and feel free to introduce her to your favorite K9. Stop by LILY 2-110 and say "hello." Make sure you introduce yourself - she's got a lot of names to learn! Roger Tormoehlen and Dan Taylor have created a new 1-credit class “ABE Ambassador Leadership Seminar” for the ABE Ambassadors. The class meets at 12:30 on Mondays for our Ambassadors and provides a 1-credit "Leadership Seminar." Our Ambassadors are valuable to our programs and we are delighted to make this special opportunity available to them! Drs. Buckmaster and Saraswat from ABE and collaborators Drs. Holland (ENTM), Ward (STAT), Krogmeier (ECE), and Erickson (AGRY) received funding from USDA NIFA under the REEU program and are excited about delivering this educational opportunity, thank you for your assistance in advertising and encourage students to participate in 2019 and beyond. 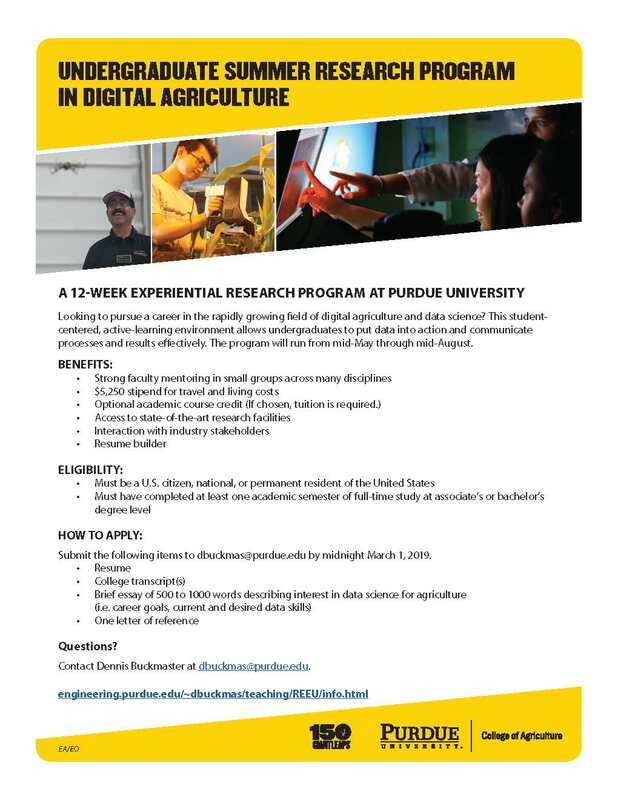 Students could spend most of summer 2019 at Purdue University in West Lafayette having a wonderful data science and digital agriculture experience. Their skill set will grow tremendously during this 12 week experience. A flyer is attached with a little more information. The deadline for students to apply is March 1. Interested students are encouraged to check out the web link on the flyer to get more details. They may contact Dr. Buckmaster (dbuckmas@purdue.edu) directly with questions. 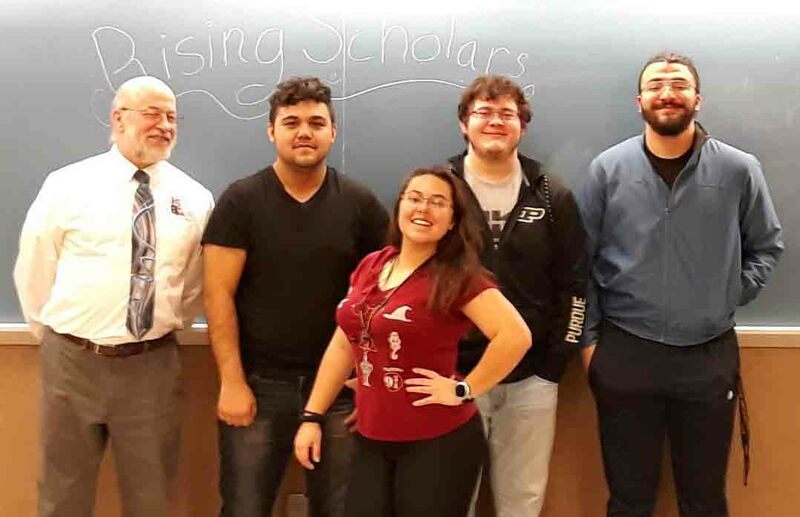 The first class of Rising Scholars at Purdue University hit a major milestone with the completion of their fall 2018 semester. All six initial students have successfully transitioned from Exploratory Studies into the major of their choice. Four of six students have remained active within the Rising Scholars program, and a fifth has entered an engineering discipline. Rising Scholars is an NSF program directed by Dr. Bob Stwalley focusing on counseling and nurturing college-bound low socio-economic students desiring STEM career majors. Participants receive networking opportunities, on-campus mentors, and a scholarships for participating in the program. Rising Scholars is jointly sponsored by the Agricultural & Biological Engineering Department and the Minority Engineering Program. The fall group activity was a seminar course focusing on professional development and technical writing. Participating students will be submitting a paper on their project activities in the Lewis Stokes Alliance for Minority Participation (LSAMP) undergraduate research program to an undergraduate research journal. A second class of nine students has just completed their first semester on the West Lafayette campus. Photo: Javier Flores, Nicole Huddleston, Marco Baez, and Richardo Gonzalez celebrate the end of their fall 2018 Rising Scholar seminar course with Dr. Bob.